L.T.N. Gould, Suffolk; sold 1943 to (P & D Colnaghi & Co., London); sold later that year to Francis F. Madan, London, as by Bellotto; (his sale, Christie, Manson & Woods, London, 15 July 1955, no. 88, as by Canaletto); purchased by H. Cevat; (David M. Koetser Gallery, New York, London, and Zurich); purchased 1957 by the Samuel H. Kress Foundation, New York; gift 1961 to NGA. See letter dated 8 May 1990 from Nadia E. Awad of the Getty Provenance Index, in NGA curatorial files. Christie's annotated sale catalogue lists the purchaser as "H. Cevat." European Masters of the Eighteenth Century, Royal Academy of Arts, London, 1954-1955, no. 4. Exhibition of Art Treasures for America from the Samuel H. Kress Collection, National Gallery of Art, Washington, D.C., 1961-1962, no. 14. Canaletto, The Metropolitan Museum of Art, New York, 1989-1990, no. 57. Obras Maestras de la National Gallery of Art de Washington, Museo Nacional de Antropología, Mexico City, 1996-1997, unnumbered catalogue, 76-77, color repro. Masterpieces from the National Gallery of Art, Washington, Kyoto Municipal Museum of Art; Tokyo Metropolitan Art Museum, 1999, no. 84, repro. The support is a plain-weave fabric of medium-fine weight. The tacking margins were removed during relining. The ground is light gray and is visible in small areas in the middle foreground. The ground beneath the sky, however, is a light pink-brown color and is visible through the paint surface where the overlying paint layer is thinly applied. This colored ground influences the overall hue of the lighter sky, although it is not clear whether the gray layer is applied over the entire support beneath the pink-brown layer, which is not discernible in the lower half of the painting. The paint is applied fluidly and the handling is characteristic of the artist at this date. Low impasto is found in some of the highlights and details; the sky is painted more rapidly and thinly with delicate brushstrokes that reveal the underlying ground through striations in the surface layer. The paint is applied primarily wet-into-wet, although details such as the ripples of the water and the figures have been applied with liquid strokes over the dry underlying surface paint. The tile roofs of the buildings are textured with small drops of paint. The reflections of the buildings in the water are painted wet-in-wet. X-radiographs indicate that the left edge of the Porta Portello in the center of the composition has been shifted slightly. There is an area of considerable loss in the center of the composition measuring approximately 15.2 x 15.2 cm. Discolored varnish was removed and the painting restored by David Bull in 1993. Parker, Karl T. The Drawings of Antonio Canaletto in the Collection of His Majesty the King at Windsor Castle. London, 1948: 46, as by Bellotto. Pallucchini 1960, 107, fig. 280. Emerson, Guy. "The Kress Collection: A Gift to the Nation." National Geographic Magazine 20 (December 1961): 824-826, color repro. Walker, John, Guy Emerson, and Charles Seymour. Art Treasures for America: An Anthology of Paintings & Sculpture in the Samuel H. Kress Collection. London, 1961: 165, repro. pl. 161, color repro. pl. 162. Constable, William George. Canaletto: Giovanni Antonio Canal, 1697-1768. 2 vols. Oxford, 1962: 1:pl. 69; 2:356-357, no. 375. Walker, John. National Gallery of Art, Washington, D.C. New York, 1963 (reprinted 1964 in French, German, and Spanish): 318, repro., as The Portello and the Brenta Canal at Padua. Summary Catalogue of European Paintings and Sculpture. National Gallery of Art, Washington, 1965: 22, as The Portello and the Brenta Canal at Padua. European Paintings and Sculpture, Illustrations. National Gallery of Art, Washington, 1968: 15, repro., as The Portello and the Brenta Canal at Padua. Puppi, Lionello. The Complete Paintings of Canaletto. Milan, 1968, 108, repro., no. 209A. Fredericksen, Burton B., and Federico Zeri. Census of Pre-Nineteenth Century Italian Paintings in North American Public Collections. Cambridge, Mass., 1972: 43. Kozakiewicz, Stefan. Bernardo Bellotto. Translated by Mary Whittall. 2 vols. Greenwich, Connecticut, 1972: 2:459, no. Z 303. Shapley, Fern Rusk. Paintings from the Samuel H. Kress Collection: Italian Schools, XVI-XVIII Century. London, 1973: 162, fig. 313, 314. European Paintings: An Illustrated Summary Catalogue. 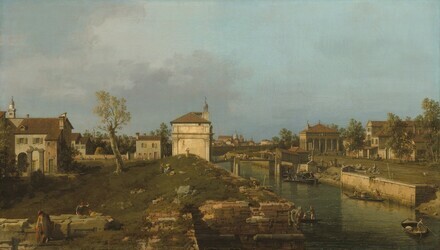 National Gallery of Art, Washington, 1975: 52, repro., as The Portello and the Brento Canal at Padua. Constable and Links 1976, 1:pl. 69; 2:383, 547, no. 375. Shapley, Fern Rusk. Catalogue of the Italian Paintings. 2 vols. National Gallery of Art, Washington, 1979: I:103-105, II:pl. 68, as The Portell and the Brento Canal at Padua. Walker, John. National Gallery of Art, Washington. Rev. ed. New York, 1984: 346, no. 480, color repro., as The Portello and the Brenta Canal at Padua. Corboz, André. Canaletto: Una Venezia immaginaria. Catalogue compiled by Anna Tortorelo. 2 vols. Milan, 1985: 2:652, repro., no. P 317. European Paintings: An Illustrated Catalogue. National Gallery of Art, Washington, 1985: 73, repro., as The Portello and the Brenta Canal at Padua. Baetjer, Katharine, and J. G. Links. Canaletto. Exh. cat. Metropolitan Museum of Art, New York, 1989: 206-207, no. 57. Constable, W. G. Canaletto: Giovanni Antonio Canal, 1697-1768. 2nd edition revised by J. G. Links, reissued with supplement and additional plates. 2 vols. Oxford, 1989: 1:pl. 69; 2:383, 547, no. 375. De Grazia, Diane, and Eric Garberson, with Edgar Peters Bowron, Peter M. Lukehart, and Mitchell Merling. Italian Paintings of the Seventeenth and Eighteenth Centuries. The Collections of the National Gallery of Art Systematic Catalogue. Washington, D.C., 1996: 31-35, color repro. 33. Zuffi, Stefano and Francesca Castira, La peinture baroque. Translated from Italian by Silvia Bonucci and Claude Sophie Mazéas. Paris, 1999: 352, color repro. Hand, John Oliver. National Gallery of Art: Master Paintings from the Collection. Washington and New York, 2004: 236-237, no. 186, color repro.